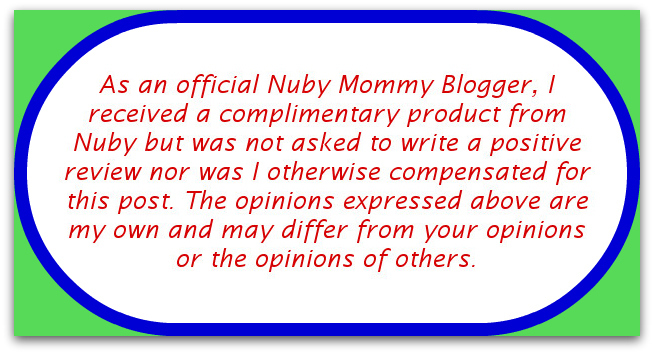 As a Nuby Mommy Blogger, I’ve received several complimentary Nuby products to test and share my results with you. It took me a while at first to choose which one I wanted to talk about today. But yesterday my son was having so much fun in the tub with his turtle, that I knew that’s the one I’d talk about next! Nuby has unveiled their awesome new bath toy product line at Buy Buy Baby- look for them in a store near you! 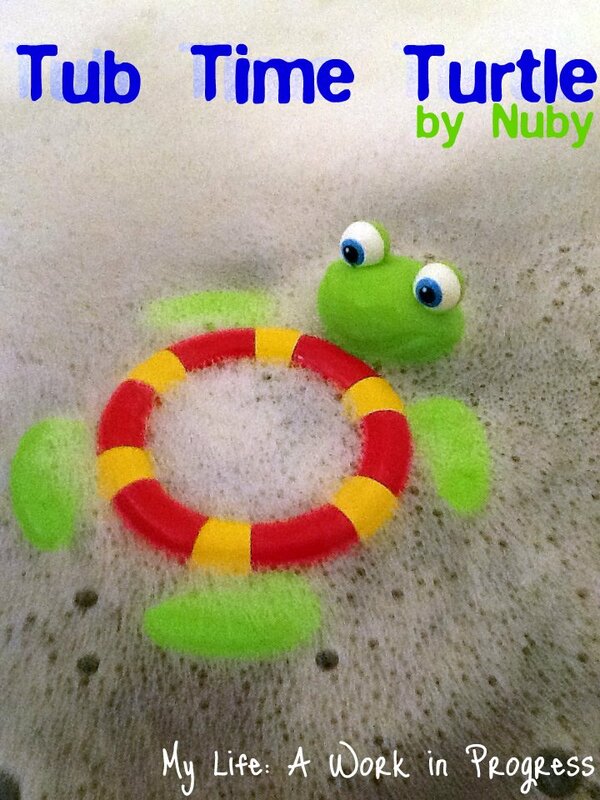 Babies can easily reach Nuby’s new Tub Time Turtle when bathing, since it floats on top of the bath water. When lifted, the Tub Time Turtle creates a fun waterfall for baby to interact with. It’s also BPA-free, so need to worry if your little budding teether wants to chew on it! The first time I gave it to Baby J, he immediately started chewing on it. Since then, he usually grabs it and sort of swishes it around in the water or bangs the water with it. Of course, he splashes all over the place, but he’s having a blast! The toy’s packaging says 9 months and up. Baby J is 10 months, and he hasn’t figured out how to do the waterfall yet, but he likes playing with the water when I lift the turtle up. He’s good at mimicking though, so I think after seeing me do it a few bath times, he’ll start lifting it up as well to make the waterfall. His coordination will still probably need work. I’ll update this post in a couple of months and let you know how he’s doing with it! It’s Baby J’s favorite bath toy! I really like this adorable toy. It seems well constructed and sturdy, yet flexible. The colors are bright and the eyeballs are stinkin’ cute. I’m excited to see more of the new Nuby bath line in the future! For updates on new Nuby products, follow them on their social media accounts listed below. They have several giveaways running right now, so make sure to visit them on Facebook. Or view my Nuby giveaway list. Is your little one eating solids or starting soon? Read my review and cleaning tips for the Nuby Nibbler! Hi, Love the eye balls! Of course the fact of their being no BPU is definitely important. I think the cuteness factor sold me 🙂 Nice blog, I looked around awhile and liked everything I saw. Have A Great Day! This looks like a really cool product. I don’t have babies anymore but something to keep in mind next time I need to buy a baby shower gift. This bath toy looks great! My LO loves tub time, so I’ll have to check this out. 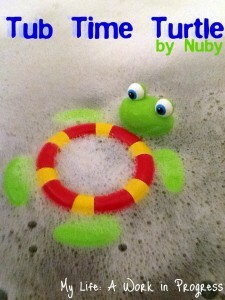 I <3 Nuby bath toys. They always hold up so well! This looks fun! We’re in need of some new bath toys, so I’ll have to remember this when I go to the store! Cute bath toy! I’ve always loved Nuby and I think my son would love this! My boys would have loved this little turtle!! I bet they would still play with it even at their age (4 and 3). Awww so cute and fun. 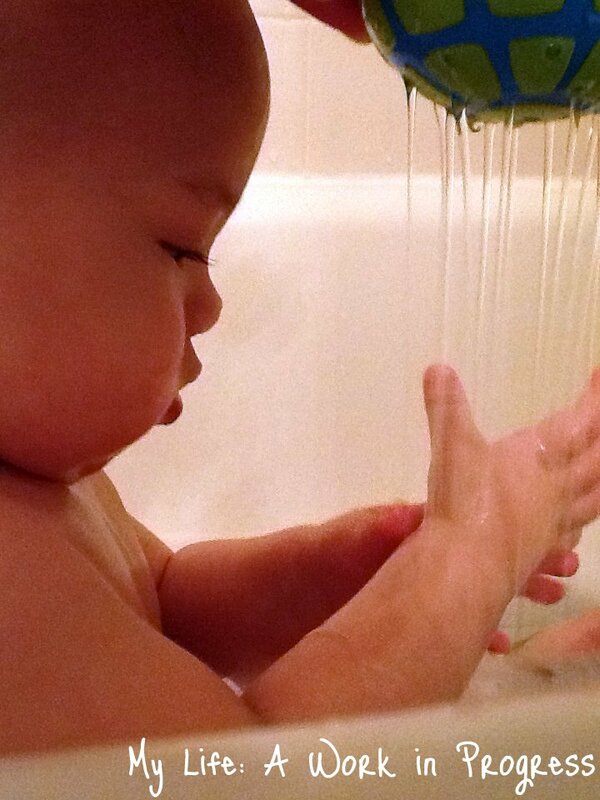 My son loves bath time and I hope when my daughter is old enough to sit and play that she will enjoy it just as much! Super cute pictures! I bet my son would love this too!